More and more adults – but also about 34 percent of obese children – suffer from non-alcoholic fatty liver disease (NAFLD). An unhealthy lifestyle with little physical activity and a diet high in fat, sugar and fructose and/or a genetic predisposition can be the underlying caus. However, fatty liver includes a broad spectrum of liver conditions and involves more than just the liver itself. NAFLD is a complex and heterogeneous disease that can lead to various complications such as severe liver damage, type 2 diabetes and cardiovascular disease. "In order to avoid these secondary diseases, fatty liver must be diagnosed in good time, and the respective risk for diseases of the liver, the heart and other organs must be precisely assessed. Then a personalized prevention and treatment can be developed," said first author Norbert Stefan. In recent years there have been many new findings and results in NAFLD research. It is difficult to integrate this enormous amount of new data from basic research and clinical hepatology and endocrinology research into clinical practice. Professor Norbert Stefan and Professor Hans-Ulrich Häring – both from Tübingen University Hospital and the Institute for Diabetes Research and Metabolic Diseases (IDM) of the Helmholtz Zentrum München, a partner of the DZD, together with Professor Kenneth Cusi from the University of Florida (USA) have evaluated the most important data of NAFLD research and compiled them in a review article. The authors propose the use of new diagnostic and therapeutic approaches in the clinic to enable a specific risk prognosis for possible secondary diseases. If patients suffer from fatty liver, positive effects can often be achieved with lifestyle intervention. For example, a reduction of about five percent in weight can reduce the fat content in the liver by up to 30 percent. However, to reduce the risk of liver inflammation and fibrosis, a weight loss of about ten percent is required. 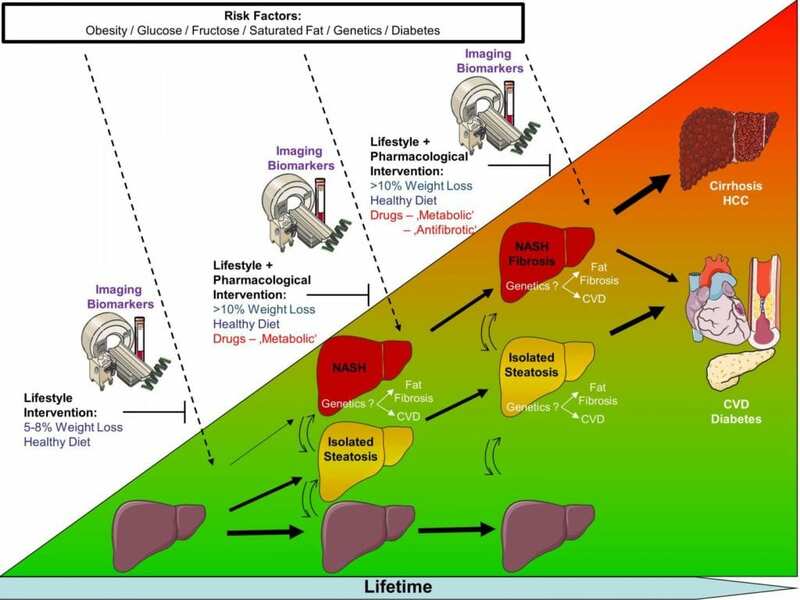 "If such weight loss cannot be achieved or is insufficient to improve NAFLD, pharmacological treatment should be considered," said Cusi. To date, no drug has been approved for NAFLD. "However, under certain conditions such as diabetes and NAFLD or obesity and NAFLD, specific drugs can be used that have different effects on liver fat content, inflammation and fibrosis," Cusi went on to say.